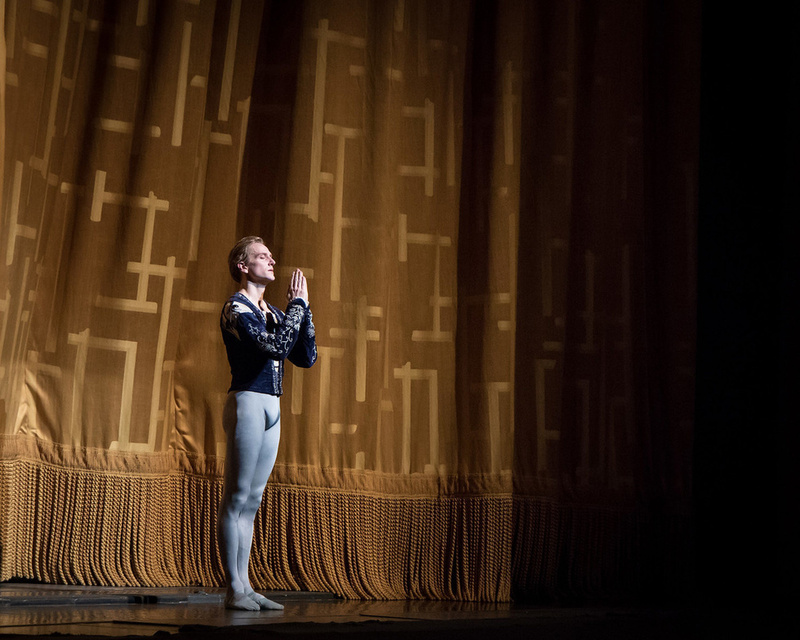 Hallberg after one of his first performances back with ABT in May 2017. Photo by Kent G. Becker, Courtesy Simon & Schuster, Inc.
What explains this drive? Early on, Hallberg writes, "I was attracted to the idea of perfection, to the fact that there are precise ways to execute every turn, jump, and step. I savored the nonnegotiable structure of the work. I couldn't get enough." Later, there was the ego boost of success and fame. In 2011, already a principal at American Ballet Theatre, he became the first American to be invited to join the Bolshoi Ballet as a principal dancer. He split his time between New York City, Moscow and a multitude of guest stages. "I felt an adrenaline rush journeying to one company after another, each vastly different from the previous ones," he writes. He was on top of the world. 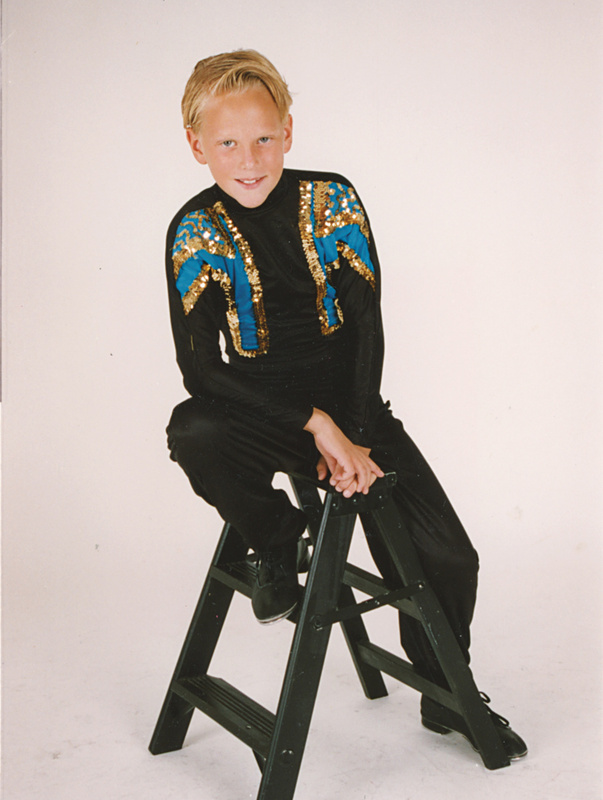 Hallberg's first dance recital at age 11. Photo Courtesy Hallberg. Until he wasn't. This frenzy of travel and performance, which left little time to prepare his body, led to fatigue and, eventually, injury. "I was already running on empty, but the difference in style [at the Bolshoi] was (as I look back now) potentially the tipping point," he writes. First he twisted an ankle, then he broke his fifth metatarsal, and later developed an acute chronic pain in his left foot. Then surgery, then more surgery. As one year away from the stage became two, he began to seriously question whether he would ever make it back. "Do you ever regret going to the Bolshoi?" I ask him. There is a pause. "The answer is no," he says. "Because of my experience there, I now have in my body and in my mental reserve how the greatest company in the world exists. But where I feel some hesitation is that I didn't know myself physically well enough, so I didn't know my physical limits." He is still unsure of when, or whether, he will perform with the Bolshoi in the future. "We're in talks," he says, simply. Hallberg backstage with ABT physical therapist Peter Marshall. Photo by Henry Leutwyler, Courtesy Simon & Schuster, Inc.
One of the most insistent motifs of Hallberg's book is solitude. In the final chapters, as he remakes his dancing body in long sessions at a rehabilitation program at The Australian Ballet—which has one of the best rehab teams in the world—he spends the evenings and weekends alone. He whiles away the hours sitting on a park bench, watching families enjoy themselves or drinking pint after pint at the pub. "That solitude forced me to go through what I went through," he says now. He sees it as part of his recovery. Hallberg at age 15 in "The Sleeping Beauty." Photo Courtesy Hallberg. Among the lessons he has learned, perhaps the most important is how to say no. And with it, the realization that dancing has become less about pleasing others and more about finding meaning and freedom onstage. He writes with awe about his experiences partnering the Russian ballerina Natalia Osipova, both at ABT and at the Bolshoi. "At last," he writes of their first Romeo and Juliet, "what I felt onstage was total honesty." The memory of these performances is still fresh. In fact, as he tells me, "she is one of the reasons I came back from all of this. To dance with her again. Every day, I thought of what I felt with her onstage." Now, the ordeal behind him, he will get his wish. This March, if all goes well, they will be reunited in Giselle at The Royal Ballet.